The Scion iQ minicar was one of the products on display for dealers. Toyota dealers have had a tough year. But company executives at a dealer conference in Las Vegas last week focused on the future, previewing several vehicles in the pipeline. Retailers were shown two variants of the Prius that will create a family of Prius-branded hybrid-electric vehicles when they go on sale by 2013. Dealers also saw a redesigned Camry, the Scion iQ minicar and the FT-86 sports car developed with Subaru -- all of which are scheduled to debut in the next 18 months. The occasion was Toyota's National Dealer Meeting, its first since the recall crisis that erupted last winter. More than 1,000 dealers attended the session at the Mandalay Bay casino and hotel, and the mood was said to be upbeat. When Toyota Motor Corp. President Akio Toyoda took to the podium, he got a standing ovation. Other speakers included Jim Lentz, president of Toyota Motor Sales U.S.A. Inc.; Yoshi Inaba, president of Toyota Motor North America; and Toyota Division General Manager Bob Carter. Executives promised that the company's U.S. operations would have a greater voice at company headquarters in Toyota City, Japan. One of the new Prius-badged hybrids shown at the meeting is bigger than the existing Prius, the other smaller. The bigger one is the Prius-V, which will have 50 percent more cargo space than the current Prius. One dealer who saw the vehicle described it as slightly smaller than a Toyota Venza but with a similar design. 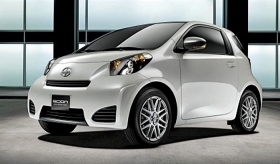 The smaller model is dubbed the Prius-C.
Executives challenged Toyota dealers to boost sales to 2 million vehicles by 2013. The brand's sales peaked at 2.16 million in 2007 and fell to 1.49 million last year. Sales through September are up 1 percent from last year in an overall market that is up 10 percent. Toyota also rolled out two new service plans that will come standard with Toyota- and Scion-brand vehicles. The plans, called Toyota Care and Scion Service Boost, will offer factory scheduled maintenance and 24-hour roadside assistance for two years or 25,000 miles, whichever comes first, the company said in an Oct. 6 statement. The plans, which are included in the vehicle price, take effect immediately. Dealers were told that boosting sales won't be easy. "They told us it's going to be a long, slow recovery," said John Horton, owner of San Francisco Toyota in San Francisco. Still, Mike Sullivan, who owns three Toyota stores in Los Angeles, said it was a positive meeting. The tone "was very, very confident," Sullivan said. "I think that came across when Bob, Jim, Akio, Yoshi all spoke, and it was very consistent. They didn't like where we all had been and feel good about how we're coming out." Sullivan said the meeting conveyed a sense of pride and a connection between the dealers and Toyota's executive team, who all had been put through a trying year because of a string of recalls and quality problems. "It was surprisingly emotional on all sides, which makes some sense when you go through the kind of year that we did," Sullivan said. "You come out of it kind of proud of each other." Horton said that he and other dealers were energized by the meeting: "I came away feeling very, very good about their plans."